Bikini blogger Charlotte Carlton's adventures! Well it's great to see my blogging buddy Miss (soon to be Mrs) Jo Telfer! So it's been a busy few weeks with many temptations in my way I have avoided most of them except for last Saturday night, but it only happens once! I have had many distractions of late with food and drink especially when I am busy with work. I found myself grabbing what I could for the last week and realised that had to change as I felt a difference again in my body shape and not a good difference! I am pleased to say I have brought my eating back into line and made sure I eat clean and find time to eat properly. I need to eat the right foods as I am back in the gym, training hard and keeping fit. I have to say I was very good when I went to Scarborough the other week with Lee & my parents. I had a naughty ice cream but everything else was clean and healthy and we did do a 5 mile walk so I'm sure I burnt the ice cream off especially with this weather and winds we are having! With work being so busy at the moment I am keeping my mind occupied most of the time so I don't find the urge to start snacking in case I do become hungry! So with Friday off work Mrs Parry-Ali herself and I headed off to Windsor for the Fitness Fiesta event, which I might add are the highlights of my year! We had a great time dancing day & night and catching up with everyone. Cheat meal was dessert due to there not being much food I like but we did stay mostly clean. This is what I love about the Mission Clean and Lean plans, they teach you how to start back clean the next day or the next meal. Life is for living and we were exercising all week end so we did both enjoy a pic and mix sweet box on the way to Windsor. All in moderation I say! So it's back being good this week until Valentines! I hope you are all ready for your Valentines evening. If you have been on the MC&L Valentines Cherish Yourself plan then I hope you are crew feeling clean, lean and body brushed beautiful. 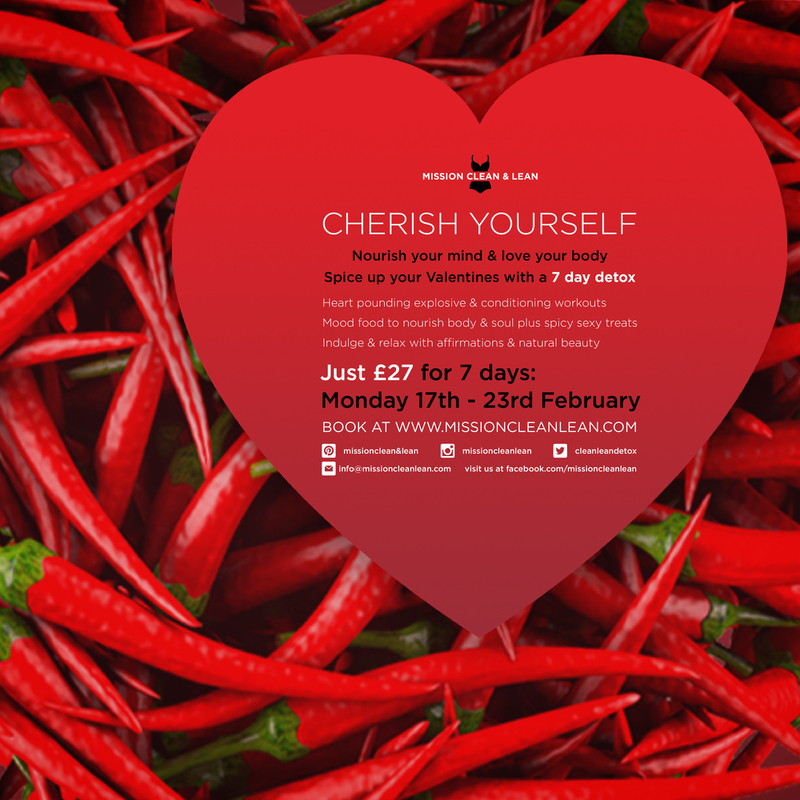 There is another Valentines plan starting Monday 17th if you fancy pampering yourself this month. Also I hear on the grape vine the girls are releasing their re branded and amended new 21 day detox starting on Monday 3rd March and what I have heard about it sounds very exciting as they have evaluated there past year’s results form the 21 day groups and developed the plan with your feedback and experiences, to make it even more impressive and results driven. Check out www.missioncleanlean.com for more details. Last but not least check out the Group Page with the girls retreat that Jo, Fern & Evie have planned, it looks a great weekend that they have planned for everyone to meet and get together. I am looking at booking on to the retreat as I love nothing more participating in group exercise classes, food demo’s, walks, talks, therapies and chilling out! Have a wonderful day I am just enjoying my Blackcurrant and Rhubarb fruit tea thanks to Twining! Older PostStressed in the City by Tracey Harding!